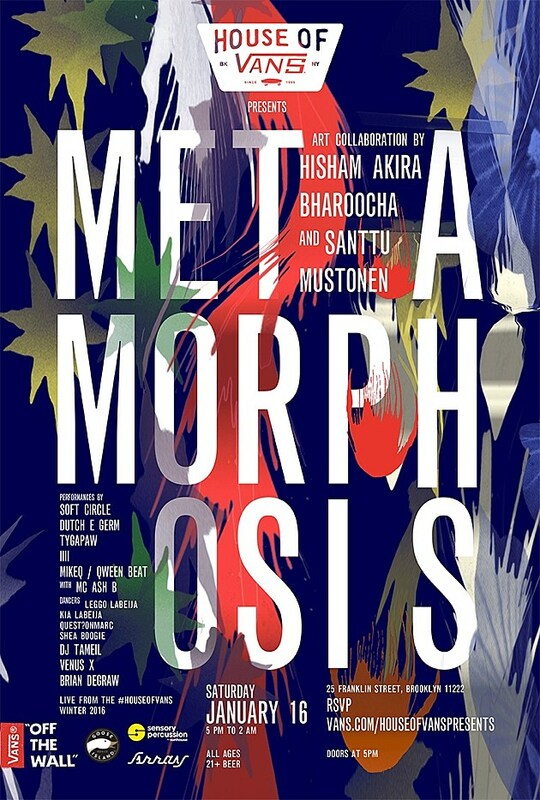 On January 16 2016, House of Vans Brooklyn hosts “Metamorphosis,” an unprecedented one-day art collaboration. Artists Hisham Akira Bharoocha and Santtu Mustonen have partnered to create an immersive, large-scale floating tunnel featuring kinetic light animations playing with a variety of interactive elements including space, light, dance and music. A full line-up of counter-culture musicians and dancers, curated by Hisham Akira Bharoocha including Brian DeGraw, Venus X, DJ Tameil, MikeQ (featuring Qween Beat with MC Ash B and dancers Leggo Labeija, Kia Labeija, quest?onmarc, Shea Boogie), IIII, Tygapaw, Dutch E Germ and Soft Circle will help bring the installation to life. Join us for this one day event and experience the 40-foot floating structure creating a tunnel with light sensor technology and projection mapping. The interactive animations, designed in collaboration with Dave Rife and Gabe Liberti of Dave and Gabe, take inspiration from metamorphosis in nature: the changing light of the day, the idea of a mutation, and ever-evolving human beliefs and progress – morphing as musicians and guests trigger the effects with Sunhouse Sensory Percussion. A 3D photobooth by A-1 Array will allow you to be a part of the experience. In proper Vans fashion, beverages provided by Goose Island and food will be available. It’s all ages with free drinks available for the 21+ crowd. Doors are at 5 PM. You have to RSVP to get in, but entry is first come, first served.